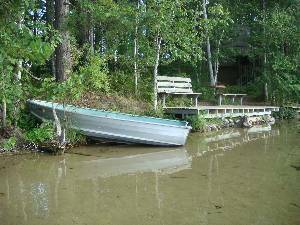 area fishing, canoeing, hiking, etc. steps away from the house. Canoe, kayak and row boat provided. Great outdoor fire pit for campfires, making s'mores and enjoying the starlit sky! 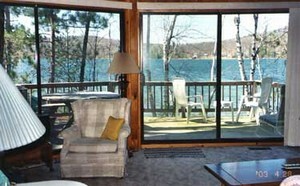 Lakeside cedar deck with great swimming just steps away from the house. 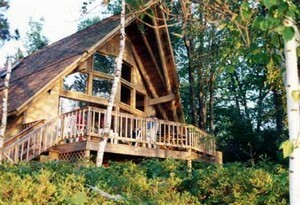 Great for mountain biking or snowmobiling on numerous forest trails within 1/2 mile of house. 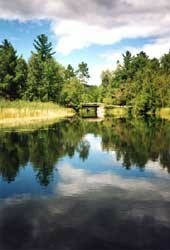 Thousands of acres of public state forest land nearby for hunting or exploring. This is the view of the house from the shoreline. We have tried to leave the area as natural as possible. 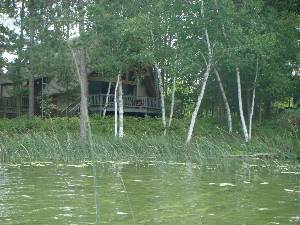 In fact, in summer, at full foliage, its difficult to see the house from the lake. This is view, out front windows/doors from the kitchen area. On outside of glass doors, there is a deck area with octogonal picnic table, chairs, and hammock. Great view of lake from here. 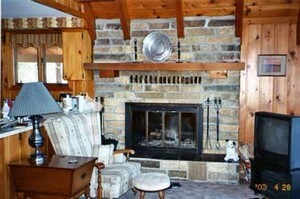 The fireplace is consturcted of natural field stone. The living room area has a cathedral ceiling and you get a great view of lake too! 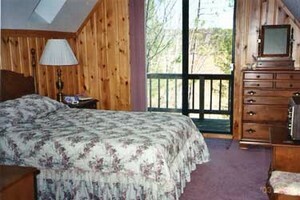 This is one of two bedrooms on the first floor. 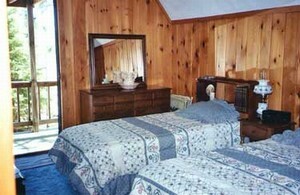 This one contains 2 twin beds, the other has a double bed. Each has access to outside deck area. During the summer, we rent for only one week periods. A week begins on a Sunday, and ends on the following Saturday. In the spring (May and early June) and the fall (usually anytime after Labor Day, rental periods of less than a week are available, with minimum stay of two nights. Deposit: One-half of amount is due at time of signing and returning to us the Rental Agreement. Balance is due no later than 14 days before the first day of the rental period. Other Fees: Cleaning fee of $60.00 is optional and is not charged if guests choose on rental agreement to perform light cleaning before they leave.